Mobile Hotspot is a wireless portable router device that connects any WiFi enabled device (smartphones, tablets, PCs) to 4.5G internet without any cable, installement or software requirements. By using a Mobile Hotspot you will avoid expensive data roaming charges and you won’t have to seek free WiFi anytime you need an internet connection. Rent ’n Connect partners with the leading mobile telecom operators in Turkey to provide you fastest and most secure connection available.While there will always be great coverage in populated cities and towns, if you are traveling to uninhabited areas we recommend you contact us so that we can verify the coverage. What kind of device will I receive? Our Mobile Hotspots: Pocket wifi. The SIM card included with your device is intended to be used with the device provided to you. What is the fair usage limit for the data? The fair usage limits are set by the operators. If you exceed the fair usage limit, no extras will be charged and the connection will remain as 4.5G speed. Can I use SMS or make calls? No, unfortunately currently we do not support use of SMS or calls on our devices. What happens to my personal information and data? All devices are fully reformatted back to brand new factory condition so that no personal information is ever stored. What are the charges for lost/stolen devices? Rent ’n Connect partners with the leading mobile telecom operators in Turkey to provide you fastest and most secure connection available. While there will always be great coverage in populated cities and towns, if you are traveling to uninhabited areas we recommend you contact us so that we can verify the coverage. Is there a coverage on a cruise / out at the sea? Rent ’n Connect offers great coverage on land, but maritime coverage will vary on your distance out at the sea. We recommend that you check with the cruise operator if there is mobile data coverage on the cruise. In the exceptional situation that there is no coverage at your travel destinations, you can cancel your Rent 'n Connect rental..
Airport, Hotel or Airbnb options are available. For further details, click on Delivery Options tab. For Istanbul: Rent ’n Connect can deliver your device same day if you place your order before 12.00 pm, and next day if you place your order after 12.00. If your delivery request is last minute, and need to be delivered on Sunday, please contact us for availability. For All other locations: Rent ’n Connect will ship your device same day if you place your order before 12.00 pm, and latest next day if you place your order after 12.00 during the weekdays. Your device will be delivered to your location of pick-up in upto 2 business days. Airport, Hotel and Airbnb options are available. 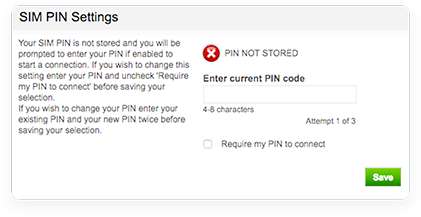 For further details, please click on Return Options tab. Please contact us if you want to make any changes regarding your reservation. Use your powerbank to charge your device when you are outside. We can deliver to you at supported airports. For details, please click here and select from the airports listed below. When you arrive at Istanbul Ataturk International Airport, you can pick up your hotspot device from TAV Primeclass Office. You can see the location of the office in the attached map and below instructions. The office is located in the international arrival terminal. After the baggage claim area and exiting from arrival gate, please turn right and go straight (follow the yellow line on the floor) until you see Starbucks Coffee in front of you. Rent ‘n Connect desk will be in front of you immediately after passing Starbucks Coffee. You will be asked to show your passport and Reservation number (Reservation ID) and you will be requested to sign the customer delivery list. Additional Information: The delivery at the airport is handled by TAV Airports. If you would like to have any of TAV Primeclass Services such as Assist Services, Fast Track and CIP Services by greeting you at the apron, please contact us and we can arrange it for you. Person on duty will wait you at the arrival gate exit immediately after the baggage claim at your arrival time of your plane. He will be holding your name written on paper and when you look around at the exit gate you should be able to see him. When you arrive at Antalya Airport you can receive your device at Desk 52 in Terminal 1. You can drop off to TAV Primeclass Offices. 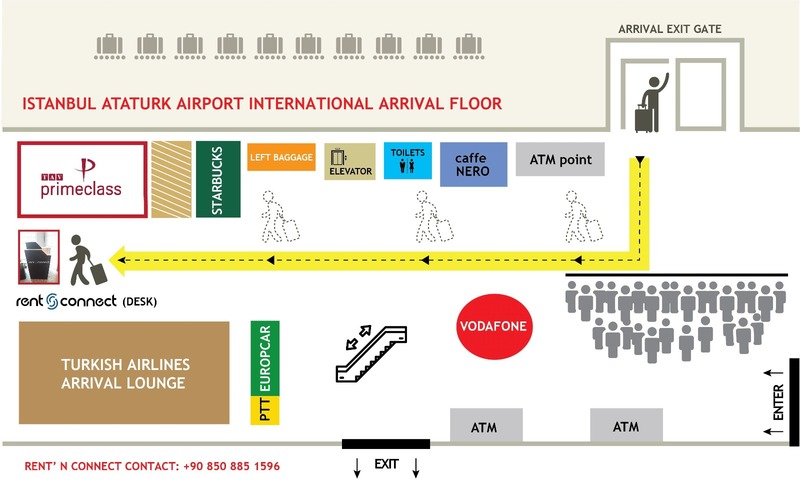 You need to contact the office by calling 4477 number by using the phone from Information Desk / Danışma at the airport. You will be asked to show your Reservation ID and return coupon will be given to you once you returned the device and you will be requested to sign customer return list as well. When you arrive at Milas Bodrum Airport, please go to the Information Desk / Danışma which is located after the baggage claim area. Using the phone at the Information Desk, please call; the extension number 6329 . (If you have any trouble locating the information desk, you can call from any phone and dial +902525230101 for domestic terminal). You will be asked to show your passport and Reservation number (Reservation ID) and you will be requested to sign the customer delivery list. When you arrive to Dalaman airport , in front of the terminal you should be able to see Individual meeting point. Could you please go to Desk 22 to pick-up your device . Your name should be written at the desk as well. Person on duty will wait you at the arrival gate exit immediately after the baggage claim in Trabzon Airport at your arrival time of your plane. He will be holding your name written on paper and when you look around at the exit gate you should be able to see him. Person on duty will wait you at arrival gate in Ordu-Giresun Airport at your arrival time of your plane. He will be holding your name written on paper and when you look around at the exit gate you should be able to see him. If you prefer to deliver your device at hotel, our colleague will deliver your device to hotel reception before your arrival. (Available in all cities). If your hotel reservation name is different than the device rental name, please mention the hotel booking name in the notes of your order. Other than the "Same Day Delivery" points, you are kindly asked to make your reservation 1-2 business days before your arrival date. You can drop off your device at the supported airports. Click here and see the airports listed below. You can drop off to Rent ‘n Connect desk (stand) which is located at International Arrival Level at the very end of the corridor next to Starbucks Coffee. You will be asked to show your reservation ID number and a return coupon will be given to you once you returned the device and you will be requested to sign customer return list as well. If the office is closed, you can also place the return box with Emanet Bagaj / Left Luggage store or PTT Post Office located in the international arrival level (near Starbucks coffee and open 24 hours). At Sabiha Gokcen Airport, please return the device before passing through passport control. After passport control, it is not possible to return except sending from your country. Post Office (“PTT”) is located at international arrival level at the end of the corridor (open at 08:30 – 17:00), you will need to fill-out a simple form and hand the box with the form to the PTT staff. You can drop off to TAV Primeclass Offices. You need to contact the office by calling 4092 number by using the phone from Information Desk / Danışma at the airport. You will be asked to show your Reservation ID and return coupon will be given to you once you returned the device and you will be requested to sign customer return list as well. You can return the device at Desk 33 in Terminal 2. You can drop off to TAV Primeclass Offices. You need to contact the office by calling 6329 number by using the phone from Information Desk / Danışma at the airport. You will be asked to show your Reservation ID and return coupon will be given to you once you returned the device and you will be requested to sign customer return list as well. You can return the device in the Individual meeting point at Desk 22. You can return the device at Sixt Rent A Car office. At Buffet which is located in the Domestic Terminal Departure level on the mezzanine floor. At the Mini Market on the left once you enter in the International Terminal Departure Level. Please provide your reservation details in your order. We will contact the hotel staff and arrange the pick up at the hotel. You may return your device at the same location where it was delivered to you.